How many people do you think MIchael Bay has killed? I’m not including the number of people he killed with bad movies, or the people who dropped dead from Transformers: Dark of the Moon related rage embolisms, or even the few hundred or so who saw the original Transformers movie and lost the will to live after seeing Optimus Prime share a screen with Shia LaBeouf. I mean that I really believe Michael Bay has his people find him the most dangerous game (like in that movie Surviving the Game starring Ice-T) and then lets them run naked through a labyrinth while popping away at them with a rocket launcher. When he’s not doing that, he’s making terrible movies and rolling around in the big pile of money they earn for him. 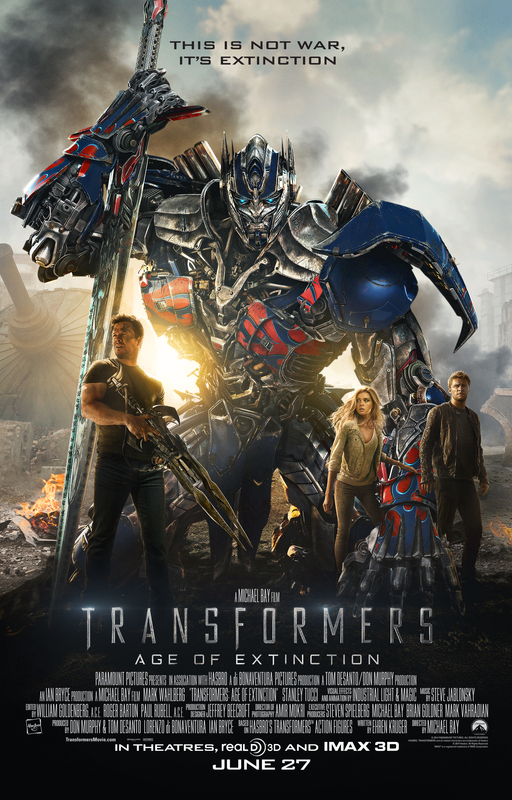 For example, Transformers: Age of Extinction. At least Shia LaBeouf doesn’t appear in this one. Instead, Marky Mark is the star, presumably because Director Bay remembers how he good he sang “You’ve Got the Touch” the theme song from The Transformers: The Movie (1986) that one time. The trailer opens with the ominous music that typically highlights something bad about to happen. A scientist tells us about science in a British accent, so you know he’s smart and knows science stuff. A Decepticon (?) is tied to a medical bed, and then Stanley Tucci is there radiating smarminess. Shift to a junked up truck being towed to the Midwest. Farmer Marky Mark and his daughter (the hot farmer’s daughter archetype replacing the hot gearhead with Daddy issues archetype from the first two films) have a sophisticated array of stuff designed to repair junked up trucks, for some reason? Maybe he’s a disgraced scientist of some kind? Anyway, I though the Midwest was constantly being flooded or tornado-ed, so I hope he has good insurance for all the equipment. So, obviously the junked up truck is Optimus Prime. Make up your own story for how he ended up in the hands of Marky Mark, because explaining that will probably not be a huge priority in the movie. They are going to spend more time on the shady government types in the caravan of black cars being mean to Marky Mark and the hot farmer’s daughter. Then things explode! Because, of course they do, because it’s a Michael Bay film. The explosion kicks us to an Optimus Prime voiceover, and he sounds serious. Apparently, humans like Stanley Tucci are hunting the Transformers, but something worse than Transformers are coming to hunt the humans AND the Transformers. I wonder if they will come together and learn to work as a team to fend off a world-threatening alien species? Hm. That one Transformer has a gun for a head. If I were a Transformer I wouldn’t waste my time turning my head into a gun just to look cool. I would turn my head into a flamethrower and roast the planet, thus rendering it human free. Anyway, alien ships that closely resemble super-sized snail shells are attacking the planet. Only one thing left to do! Bust out some Dinobots. Wait, what? Yes, you read that right. The Dinobots, the spoiled bratty children/pets made by Transformers finally appear, presumably to fight against the super-sized snail ships. Bumblebee is back and there is also some weird looking Transformers with a manly beard made of thick beaded cables. More explosions, Marky Mark somehow maintaining a straight face while talking life and death with a giant children’s toy, transformer sound effect. More explosions, hot farmer’s daughter, Marky Mark gets a gun, a Transformer who could find work as an obesity poster child, and OH MY LORD THAT DINOBOT IS BREATHING FIRE. Then, Optimus Prime rides the fire-breathing Dinobot through cite streets while carrying what appears to be a red-hot glowing claymore. Well, there’s something you don’t see everyday. it might be worth my while to peek into the theater just for that scene alone.